Ever since humans set sail and started to harness ocean resources, knowledge of the sea has been crucial. Advances in science and technology are core drivers in the utilization and governance of the oceans. The expansion of the Portuguese Empire was only possible through new navigation and shipbuilding techniques. The British Empire, that long served as the steward of the global oceans, was dependent on advances in ocean science and technology. Indeed, during that period “the British Admirality, maritime community, and scientific elite collaborated to bring order to the world’s seas”. Likewise, marine science was a core tool during the cold war era, not only to pursue national agendas but also to enhance international cooperation in ordering the sea. Today, we have left behind the age of empires and a bi-polar world order. The order of the sea looks very different. On the one hand, since the late 1980s, the establishment of UNCLOS and related regimes have done much to embed commonly agreed norms and practices of political order at sea, whether in relation to maritime stewardship, the free passage of commerce, or the demarcation of territorial waters and other maritime zones. On the other hand, the degradation of ocean health, rising inter-state tensions in areas such as the Arctic or the South China Sea, and the emergence of new maritime insecurities, such as piracy, people smuggling or fishery related crimes, present significant challenges. For many, this leads to the conclusion that we are facing a “new anarchy” at sea. Whether one shares the optimistic viewpoint of the sea becoming increasingly more ordered, or the pessimistic one of a new anarchy, there is little doubt that better ocean governance is a necessity. 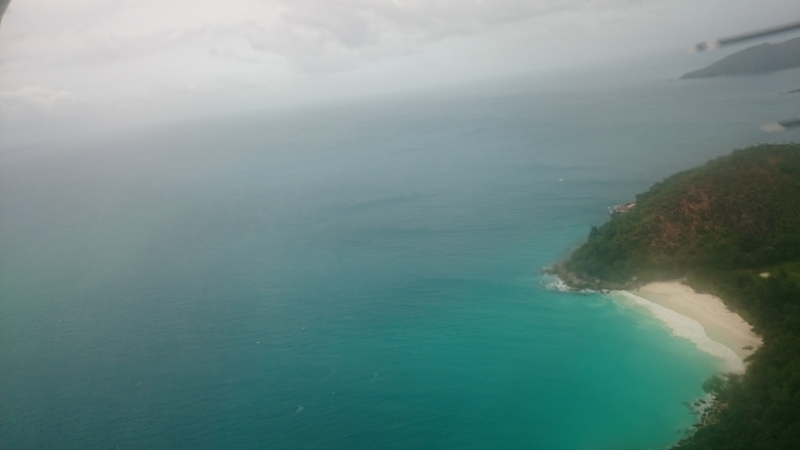 Better ocean governance can only be envisioned if knowledge of the sea is advanced. To pursue the goals as they are expressed under the three maritime agendas, namely ‘maritime security’, ‘blue economy’ and ‘ocean health’, the close link between knowledge and governance has to be considered. Attention is required on how science, technology and knowledge production of the sea can be advanced and play a role in ocean governance. Knowing what happens at sea is the goal of what has become known as Maritime Domain Awareness (MDA). This concept was introduced as part of new maritime strategic thinking in the US. As it was defined in this context, MDA is “the effective understanding of anything associated with the maritime domain that could impact […] security, safety, economy or environment” (US Government 2005). This renders MDA a very broad concept that basically encapsulates all the three political agendas aiming at improving ocean governance. What is most important in the US understanding of MDA is the emphasis put on not just gathering of ‘big data’, but also on the sharing of information across states and organizations. The backdrops of this new approach to knowing the sea are advances in maritime data collection and analysis. Data about the sea is collected by automated transmitters and sensors such as AIS and LRIT. It is also provided by reconnaissance planes, radars and increasingly satellites and drones. Data from human sources is delivered through various issue-specific reporting systems. These span from the reporting provisions of the ISPS code, voluntary reporting on ship movements as part of counter-piracy best management practices, to reports provided by coastal spotters and leisure boats. Over the past decade a broad range of new information sharing institutions have been created to share and subsequently fuse data across agencies specialized in issues, such as piracy, fishery inspection, border control and customs, in order to produce a common picture. This includes national processes and institutions such as the UK’s National Maritime Information Sharing Centre (NMIC), or the US’ Maritime Operations Threat Response (MOTR) process under the Global MOTR Coordination Center (GMCC). It also entails transnational projects such as the European Union’s Common Information Sharing Environment (CISE), Singapore’s regional Information Fusion Centre (IFC) for Southeast Asia, or the Djibouti Code of Conducts’ Information Sharing Network for the Western Indian Ocean. In other cases, MDA is provided in more loose and ad hoc infrastructures. Examples include mechanisms such as the Shared Awareness and Deconfliction (SHADE) mechanism and its Mercury platform developed to address piracy in the Western Indian Ocean, or the Combined Maritime Forces (CMF) operating in the same area. Other projects also target specific issues, such as the Project Eye on the Seas targeted at address illegal fishing. Maritime Domain Awareness is however not without its challenges. It implies quite a complicated system involving technologies, different institutions within and across countries, public and private actors, the military, commercial entities and so on. As stipulated in the US definition, it is a very broad and ambitious socio-technical enterprise bringing in all the aforementioned actors and data types together. In the following, we discuss a range of challenges to MDA that were identified during the Ideas Lab. The first and perhaps central challenge is the problem of developing trust along with lack of a culture of sharing information across states and organizations. A second set of challenge is technical and relates to the amount of data required, forms of processing it and developing decision support tools. Finally, the other challenge relates to the link between knowledge and action. 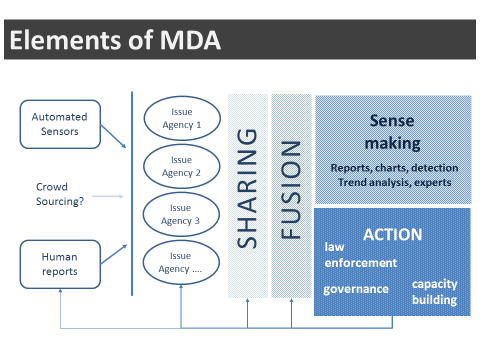 MDA can only be efficacious if it informs action. Maritime Domain awareness activities are not situated in a political vacuum. They take place in a global political landscape that remains characterized by competition, contestation and rivalry. One should not lose sight of the geostrategic context where, even among allies, withholding information is the norm rather than the exception. Information, and the capacity to gather and utilize it, is considered to be a crucial source of power. It should be remembered that most MDA activities, including that of the US or UK, are underpinned by national security interests which do not always align with the interests of others. Moreover, there is a tendency by regional powers to treat certain waters as their own backyard. The strive for maintaining information superiority and edge is hence a core hindrance for establishing trust and the sharing of data across states. Legal constraints concerning the ownership of data further exacerbate the problem, as do recent concerns over cyber-security. This does not, however, imply that international information sharing is impossible. Indeed, the example of the SHADE mechanism in the Western Indian Ocean and Mercury – the information sharing platform linked to it – provides a powerful case for how trust can be developed and information can be shared between competing countries. MERCURY is a web-based platform and hence does not require the instalment of equipment on board ships. As a result, even countries like China and Russia were willing to participate. MERCURY also helped to overcome political tensions in NATO-EU cooperation that are caused by differences in membership. The lack of trust that may inhibit information sharing is not limited to the international scene, but also manifests in inter-agency rivalry and differences within countries. MDA cannot possibly be undertaken by a single agency. A number of agencies are bound to take part in MDA related activities. Information sharing and inter-agency cooperation require building trust and effective relations across professions, organizational cultures, and jurisdictions. Divides, such as those between civil and military actors, need to be overcome. However, this can prove to be a challenge in practice. Within military culture one finds a strong secretive mindset, while in civil law enforcement agencies it is primarily legal constraints that prohibit the sharing of data. Similar problems arise in the cooperation between state agencies and the shipping industry. While voluntary sharing of data on shipping would be ideal, companies fear the costs of security provisions. Hence, ships have a tendency to make coastal states the last entity to contact due to fear of reprisals. A difference in scale of operation among agencies is also an important consideration while discussing organizational challenges. For instance, maritime surveillance is done by navies on global scale geared towards military activities. Coastguards, border agencies and maritime conservation organizations operate on a more local scale. This variation in scale of operation combined with competition over budget allocation as well as desire to assume a central role in MDA may result in competition, rather than collaboration. UK’s NMIC is an example of a good response in overcoming such challenges. NMIC, a child of the security measures of the London Olympics, transformed the UK’s MDA from a fragmented multi-agency activity into a cross-governmental responsibility. NMIC brings together up to 17 different agencies. NMIC does not have an independent budget, and as such is not owned by any of the agencies. It becomes active once it is tasked to respond to a certain incident or challenge. Thus, its function is to conduct analysis and inform relevant bodies. In itself NMIC does not, however, have the capability or the mandate to translate infused information into action. The technological challenges posed by MDA are vast. “Massive amounts of data on all aspects of maritime activity must be collected, then cross-referenced, “fused” (generally speaking, correlated across sources), and analysed, in order to detect anomalies that may indicate threat-related behaviour”. Information and computer sciences are, hence, vital in the advancement of knowledge production of the sea. The volume of data required is huge. For instance, NMIC receives over 10 million reports a day and this figure is only from vessels that want to be identified. Capability to do MDA is obviously challenged by the deterritorialized nature of the oceans as well as the sheer size of the water surface that needs to be monitored. Activity at seas can, moreover, change rapidly. Ships change name and flags in short time. Cargo is transferred and re-loaded. Satellite imagery, AIS and LRIT can help in increasing the monitoring range. However, cases of lost ships or planes, such as MH370, highlight the limited capability to monitor the oceans in their entirety. It is thus imperative that MDA is more than just the collection of all available data, but rather data needed for specific tasks. An insightful example for such targeted approach to MDA was the management of the 2014 Ebola outbreak in Western Africa. The known incubation period of 21 days provided the basis for closely monitoring and potentially quarantining of selected vessels arriving from West Africa during that period. Selective monitoring and gathering of data is hence an important response to the technical challenge. The price tag of assets as well as data, such as satellite and AIS data, is also a potential hurdle for MDA. One way of decreasing the costs is crowd sourcing. Crowd sourcing in the maritime domain is at its early experimental stages, yet, has already proven to be a productive tool, albeit with limitations. Nevertheless, it offers promising opportunities as well as challenges. Crowd sourcing however does not escape problems of trust and confidence over the source. The electronic counter-piracy information sharing platform MERCURY can be seen as a potentially promising approach. MERCURY offers a semi-controlled environment. One has to be cleared to participate and participants are in a position to identify the source of any particular information. The provision of subsequent confirmation following initial reporting available on MERCURY also ensures that participants trust the information on the platform. In other words, information sharing through crowd sourcing implies developing the right platform that will help one to share secured and trusted information in real time. Data does not have meaning in itself but requires interpretation and analysis. A process of sense making is necessary if data is to be rendered usable. Data is restrictive in what it can tell and it is difficult to know what it is not telling. It is thus imperative to identify what type of information is needed for which purpose, be it to establish patterns and trends, to identify issues that call for immediate law enforcement action, to inform strategic thinking, or develop new legal and governance frameworks. Computer Sciences have made substantial progress in automation and developing decision support systems. Studies have been undertaken with the aim of enhancing sense making in order to reduce ‘data to decision cycle time’, as well as increase accuracy. Algorithms allow an analyst to make causal arguments and the system automatically generates counter arguments alerting the analyst to possibly overlooked factors. If the input information is not adequate to make decisions, the analyst will be prompted to avoid confirmation bias. Furthermore, such systems can potentially be capable of assisting in filtering out and sifting unnecessary information, hence, going some way in addressing the challenge associated with the huge volume of data involved. The Piracy, Maritime Awareness and Risks project, known as PMAR, of the Blue hub platform of European Commission Joint Research Centre is one of such projects. It is a good demonstration of sense-making using maritime metadata. AIS and LRIT data are used to analyse traffic flows, routes as well as ship speeds over time. Designed for end users in East Africa, PMAR is still in the test phase. How the tool can be used in law enforcement by the clients to whom it is intended still remains an open question. This points to the importance of the human-technology interface. The data generated by AIS or LRIT for instance is automatic data, but the questions of what can be done with that data and what human expertise is required to develop strategic and tactical maritime pictures remain. The human-technology interface hence needs scrutiny if we are to fully understand the potentials and challenges of MDA. Data can only tell as much as it is interpreted. For instance, AIS data is automatically transmitted to satellites and that transmission should be picked up by 3 satellites. If that is not the case, then systems will trigger alerts. It is then up to the systems’ users to investigate if it was a technical issue or an intentional action by the ship or if illicit activities are involved and so on. Hence, smooth interface between automatic technology and a human expertise able to make sense of alerts and the data generated is essential. Personnel equipped with the necessary skills and expertise to understand and optimally utilize the data available is required. Given the importance of selective data gathering tailored to specific tasks, knowing what sort of data is required is essential. If staff are not equipped with the necessary expertise, alerts and maritime data is of little use. So far the expertise housed in MDA centres, such as those on the East African coast, is not solid enough. Capacity building in the form of training and education, as conducted for instance by the European Union’s Critical Maritime Routes project, is hence an important component of MDA. If expertise is not developed locally over time, introducing high-tech data collection and analysis tools will not enhance MDA capabilities in such regions. Regional cooperation and a common sense of security among countries can go some way in enhancing MDA capabilities in developing regions. However, questions of trust issues are also relevant here considering these regions often include countries with a common history of rivalry and mistrust. MDA only becomes meaningful if it is capable of triggering subsequent action. This may take a number of forms: rapid responses to incidents, improving the routines of law enforcement that ensure good order at sea, capacity building that assists states to improve their ability to contribute to good order at sea, or building stronger legal and political institutions of ocean governance on a national, bilateral or multilateral level. Action however can prove to be problematic as it will involve decision making at higher political levels. Actions taken at this level may not necessarily involve the experts or those familiar with the maritime domain. The political level is embedded with considerations other than a simple problem-diagnosis-problem solving pattern that would take place in ideal scenarios. Knowledge produced by MDA centres and activities can also be easily co-opted and misinterpreted in order to render it befitting to certain political agenda. The Promises and Perils of MDA: What Future for the Agenda? Arguably we should be sceptical about the ability to gain full Maritime Domain Awareness on the scale suggested by the US definition. MDA is most useful if it is attuned to its limits, identifies the tasks and areas where it can make a difference, and provides readily usable knowledge to make informed decisions. Furthermore, no single country can undertake MDA on its own and there is a need to cooperate. Trust hence becomes a salient issue here. Collaboration of agencies and assets between partner nations is essential. Rivalries, the quest for information superiority, as well as regional, national and organizational differences in culture, expertise and capabilities are core challenges. In addition, the urgency of enhancing MDA capabilities is not necessarily equally shared among nations or organizations. Differences between the priorities and needs of countries will also entail different information being sought and different scale of MDA required. A country concerned with illegal fishing will have different information needs than one concerned with global maritime terrorism. The most interesting promise of MDA is its ability to bring people from different fields ranging from civil law enforcement agencies, the military, the commercial side and academia together in a common project of knowing the sea. MDA provides avenues to cross-fertilize ideas and work together to advance our knowledge of the sea. This was clearly observed during this one day workshop where there was a stimulating and lively engagement between participants from various backgrounds such as between computer science experts and those from military background. Maritime Domain Awareness is indeed a very current and fertile ground for engagement and cooperation. It is also a mining field for ideas and research, and increased engagement is very much required. For further information on the event, please contact Dr. Christian Bueger. Boraz, S. C. 2009. Maritime Domain Awareness. Myths and Realities. Naval War College Review 62 (3), pp. 136–146. Bremner, L. 2015. Fluid Ontologies in the Search for MH370. Journal of the Indian Ocean Region 11(1), pp. 8–29. Gebhard, C., and Smith, S.J. 2015. The Two Faces of EU−NATO Cooperation: Counter-Piracy Operations off the Somali Coast. Cooperation and Conflict 50(1), pp. 107-127. Hamblin, J. D. 2005. Oceanographers and the Cold War: Disciples of Marine Science. Seattle: The University of Washington Press. Kraska, J. and Pedrozo, R. 2013. International Maritime Security Law. Leiden & Boston: Martinus Nijhoff. Law, J. 1986. On the Methods of Long Distance Control: Vessels, Navigation, and the Portuguese Route to India. In: Law, J. ed. Power, Action and Belief: A New Sociology of Knowledge? London & Boston: Routledge & Kegan Paul, pp. 234-263. Law, J. 1987. On the Social Explanation of Technical Change: The Case of the Portuguese Maritime Expansion. Technology and Culture 28(2), pp. 227-252. Mack, J. 2011. The Sea: A Cultural History. London: Reaktion Books Ltd.
Rahman, C. 2010. Maritime Domain Awareness in Australia and New Zealand. In Klein, N., Mossop, J., and Rothwell, D. R. eds. Maritime Security: International Law and Policy Perspectives from Australia and New Zealand. Abingdon: Routledge, pp. 202-223. Reidy, M. S. 2009. Tides of History: Ocean Science and Her Majesty’s Navy. Chicago & London: The University of Chicago Press. U.S Government, 2005. The National Strategy for Maritime Security. Washington: The White House.